I'm sure there will many stories to follow! But to keep it short for now, congratulations to your new National Champions, RVA Graphics & Wraps, and to all the finishers. 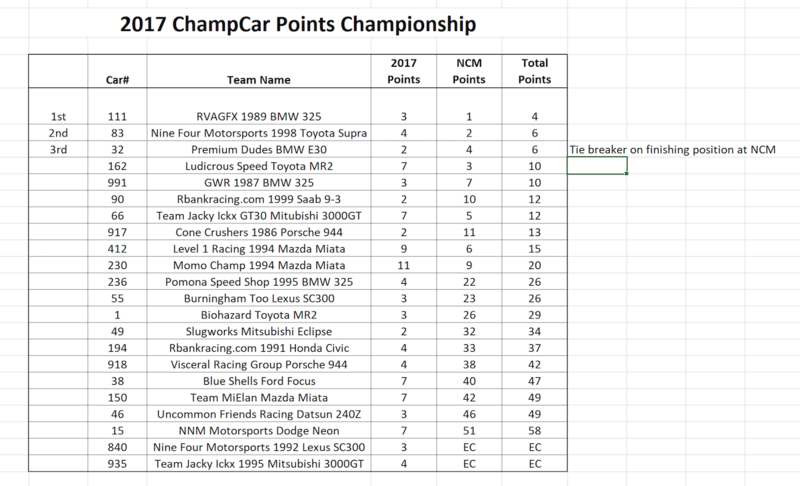 Championship Points total - image, for now, will post to CCES website as PDF later. E30's can have 4.10's without additional points. Chumpcar; Where the rules are made up and the points don't matter! Congrats to rva! They are longtime racers, supporters, and overall great people! Drove 1 lap Sunday, set the fastest lap up to that point in the race immediately before the half shaft decided to pop out of the diff. I think I jinxed it when I said "pick an SC300 to win a race." My favorite quote of the weekend I happened to overhear. "You hit my front bumper again!" Thanks to the Burningham guys for inviting me, I had a great time with a great group of guys and gal! Congrats to RVAGFX and all the other contenders. Thanks to ChampCar for putting on another great race. Did anyone file a protest? What pdf? Am I missing something? The PDF in the original post only shows race result, not championship results. Sponsorship opportunities is what Bill is referring to. A truly epic event. Thank you chump staff and volunteers for making this possible. This is news to me. Thankfully it's not news to anyone else. What official BMW document shows that a 4.10 was available as an option on a manual transmission car? Watching on the youtube feed, it sure looked like a fun time. We might have to try this track next year. I learned Bill needs to get cool suits for his camera so they don't overheat in the heat and humidity! I think it was an option on the 318is, but not sure. Read that again, the operative words are year, make and model [not transmission type]. Overall good event but it was extremely hot. 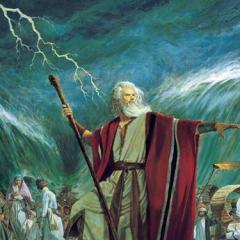 I was reminded on why I don't typically drive in anything in June or July. One of my uncles teammates couldn't attend so I was asked to fill in and drive the 66 fastback mustang. That thing is a handful to drive as it has no power steering and no power brakes. Luckily, we participated in the practice day so I got to get use pumping the brakes to get them to actually work....scary. I had never driven the car or the track before. Picked up the track after a couple of sessions but I did not enjoy it. It doesn't have a good flow to it at all imo. They opted to have me start the race as I had the most experience and was quickest by a large margin. Put in a decent stint but got a flat about 1:20 in. Swapped it and carried on. From my observation everyone was driving very courteously so kudos to all on that. We ended up ripping the rear pass side upper control arm out of the frame about 30 min on Sunday so we parked it. Nothing you can really do about that except get it home and reinforce/fix. I think they'll be ready for Sebring. Fantastic weekend. Corner workers and safety crew were fantastic. ChampCar crew was great, thanks to them as always. The level of competition was well beyond any race I’ve done before. We ran hard for 16 hours and took 3rd place in the championship! More to post later. I cut out early due to broken racecar. Anyone know which cars got dyno'd and what were the numbers? Chumpcar; Where the rules are made up and the points﻿ don't ﻿matter! Aren't all rules made up? I saw on instagram that RVA did 170hp. Someone told me that GWR dyno'd around 160hp. The supra in second place did 209hp. Interesting...GWR has roughly SPEC E30 numbers. I figured they'd be higher. 170HP seems to be reasonable for a well tuned Champcar E30. Supra is pretty much spot-on too. Hey Shutupraracing, Shut up & race! Didn't see your car there, why you talking trash? Read the rules & interpret, this is not a Spec series. It was hot as hell & was a race of attrition. There were 10 cars that were always in contention until they were not. Congrats to everyone that actually finished, that was a feat in & of itself. Hats off to the staff & volunteers. Awesome weekend, we (Blue Catvalier) melted a wheel bearing and destroyed a CV on the first stint Saturday. Luckily we were able to run all Sunday. That was the cleanest racing I've experienced, and the corner works/safety crew did an amazing job. I'm curious if the team with the white/blue 3000GT have any footage of me nearly spinning off track at turn 16 (sunday around noon). Our camera wasn't running but I'd love to see footage if it exist. Great job in the national championship race! Despite, as you said, the field being so very strong, you guys showcased what a well prepared car running a steady pace, can do. While you were a few seconds off the pace of the "aero E30's", your approach of keeping it simple seems to have paid off. I know you guys anticipated this race with a lot of energy - I hope you realize what a great accomplishment you portrayed of "the little guy" having great success. I'm proud to call you guys my friends and look forward to seeing you at a track again soon. Congrats to the top running teams. You guys were obviously well prepared and ready for the immense challenge of track, heat, and tough competition. I applaud ALL the teams who finished, as well as those who attempted to compete at NCM. As for the race itself, and the Champcar Live broadcast team and Champcar officials - WELL DONE!!! It's hard to believe how far this series has come and just how legitimate and sensible it is to be a proud member of this organization. Despite some of the gruff we see on this forum at times, this is truly a great group of people on both sides, the management, as well as the racing teams and volunteers. I believe we saw Champcars' finest days this past weekend, and am confident that it too will be surpassed in the future as we continue to grow together. The supra in second place did 200hp. Supra did 209hp/200tq I though. RVA Dyno was strong. 170hp in a 2300lb car is pretty legit. Congrats to RVA on the Chumpionship!